All artistic movement has a historical moment to establish its starting point. In the case of modernism in Barcelona there are two moments in particular: the Universal Exhibition of 1888 and the International Exhibition of 1929. These two celebrations were used as an “excuse” to decorate the city and develop Barcelona’s famous creativity (which brought a success to his star architect: Gaudí) on walls, buildings and other items to show to the world. However none of this would have been possible without the populous and famous Catalan bourgeoisie. In the late nineteenth century wealthy families who had made their capital thanks to the significant presence of the industrial revolution in Barcelona, they decided to invest most of its assets in beautiful buildings which could be used as pompous houses but also, thanks to its stylistic value, were the perfect tool to perpetuate their names. That’s why today we know surnames as the Batlló family, Mila or, especially, the Güell (thanks to the Palau, the Park and the Colonia). Without the bourgeoisies families it wouldn’t have been possible the rise of modernism in Barcelona. But it wouldn’t have been possible neither without the remarkable architects who built all those magnificent buildings. 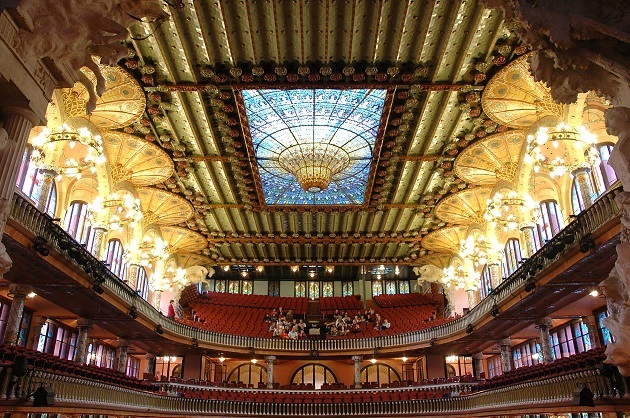 More than 100 architects enthralled the city, but among them three names stand out: Antoni Gaudí, Lluís Domènech i Montaner and Josep Puig i Cadafalch. The first of them needs no presentation: Gaudi and Barcelona are synonymous names and thanks to this truly relationship wonders like the Sagrada Familia, Park Guell, La Pedrera and Casa Batllo have emerged, all of them considered World Heritage Sites. Likewise two jewels of Lluís Domenech i Montaner are considered heritage of humanity: the magnificent complex of the Hospital de Sant Pau and the equally magnificent Palau de la Música, whose inverted glass dome leaves speechless every visitor. Josep Puig i Cadafalch, despite not having any work on the UNESCO list, is the architect of many well worth buildings like the Casa Amatller, the Casa de les Punxes or the Plaça de Espanya. 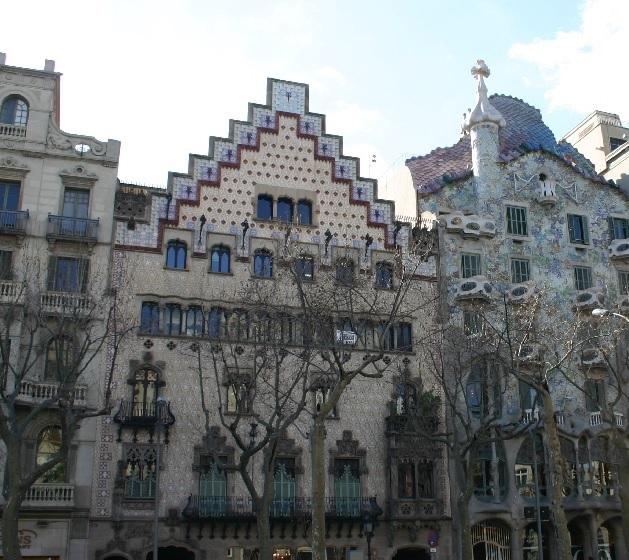 But there is a place in Barcelona where modernism is the real protagonist: the set of buildings located between the streets Consell de Cent and Aragó Street, in the middle of Passeig de Gracia. Modernist lampposts and banks ride are joined by a group of five houses, which are part of the history of Barcelona and seem to be part of a famous competition. A world-famous Casa Batlló by Gaudi joined others magnificent houses as neighbors: modernist buildings such as Casa Lleó Morera (by Lluis Domenech i Montaner), Casa Mulleras (by Enric Sagnier), Casa Bonet (by Marcel·lià Coquillat) and Casa Amatller (by Josep Puig i Cadafalch). It was a truly competition in the middle of the city to see who was the most outstanding architect.